Bloodborne is a game that asks a lot of its players. While not a sequel to any of From Software's other Souls games, it most definitely belongs in the series; and though it has some shortcomings, it might be my favorite one yet. You are a Hunter, participating in a nightly Hunt in the city of Yharnam. The purpose of this macabre ritual is to seek out and put an end to those people who are afflicted by a mysterious disease that causes beast transformation. Some of these poor souls are already changed and show the barest shred of humanity. Along the way you'll discover that not everything is as it initially seems, and the Hunt may not serve the purpose you think it does. Still, you must set out to cleanse the foul streets. The original Dark Souls had brilliantly labyrinthine level design that rewarded exploration and allowed you to unlock all sorts of clever shortcuts, while its sequel was more linear in design. Thankfully, Bloodborne's levels are a glorious return to form. 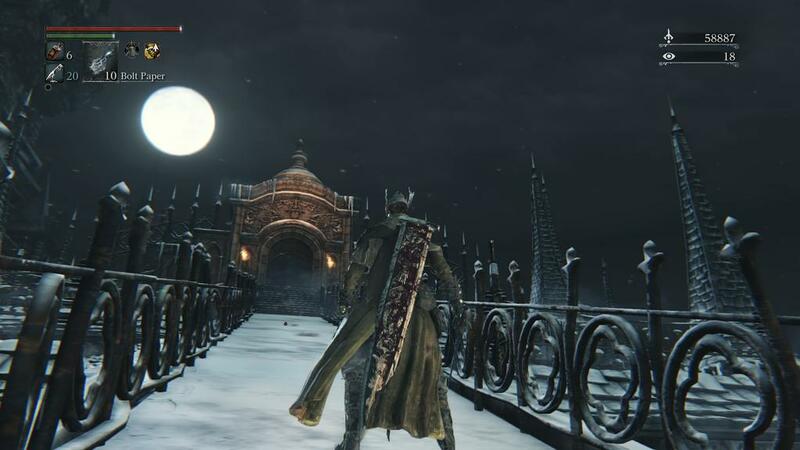 Yharnam is a twisted place filled with Gothic architecture, barricaded streets, and a few too many graveyards. Slaughtered beasts and the corpses of the fallen litter the path you walk. I was often surprised to find out how some of the levels weaved and merged into others. It's rare that any kind of side street or alcove exists without purpose; they often hide at least some kind of item or reward. In the end, though, all things lead to the series' famous boss fights. In previous games, the bosses, while huge and intimidating, often had an air of dignity around them. 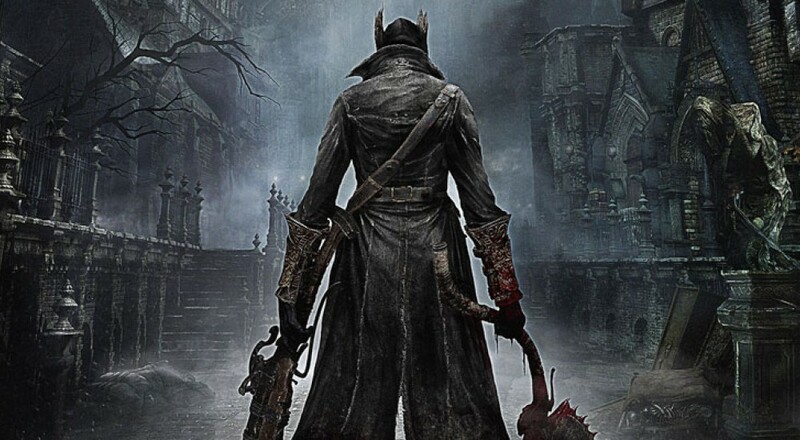 In contrast, Bloodborne's are terrifying; incorporating corporeal horror and terrific sound design that more than once led to my wife requesting that I play with headphones on. These fights are thrilling and memorable, and several rank among the game's greatest moments. A few minibosses (and zone bosses) are Hunters just like you, which stand in contrast to the hulking beasts you normally fight. Taking on someone with the same mechanical toolset as you is quite a challenge, and one early boss was definitely a personal roadblock. Unlike the Dark Souls games, combat in Bloodborne rewards aggressive play. In the Souls games, players could hide behind a shield and heavy armor to absorb damage. More skilled players could eschew defense in favor of dodging attacks or outright parrying them, but the punishment for a mistake was severe. Here, taking a hit or two doesn't immediately drain your hit points. Instead, you have a short window to strike the enemy back, regaining some of your lost health in the process. In fact, it's possible to take a pretty massive hit and gain nearly all of your health back afterward following a well-timed counterattack. The weapons in Bloodborne are among my favorite additions. Called Trick Weapons, nearly everything you hold in your main hand can transform in one way or another. Your offensive options range from a Saw Cleaver that converts from a short-range melee weapon to a longsword-like slashing weapon to more exotic weaponry like the Reiterpallasch, which is a dueling epee with a pistol attached. Weapons can also be transformed mid-combo, which allows for some truly devastating maneuvers. It's satisfying to be able to carry a single tool that serves multiple purposes. Rather than a shield (though there is ONE you can equip, almost as a joke), your character can carry a firearm in their offhand. For the most part they don't do a terrible amount of damage, but a shot fired mid-combo can knock an enemy out of their attack animation and leave them wide open for a visceral attack. Visceral attacks replace backstabs and counterattacks from previous Souls games, and you can trigger them on nearly every enemy and boss in the game. Players familiar with the series will notice very quickly that there are no spells, but roughly halfway through the game you'll start accumulating Hunter Tools that trigger spell-like effects, such as causing an area-of-effect knockdown or buffing your firearms to do more damage. It would be very difficult to build a character that uses them as their primary means of damage, however.